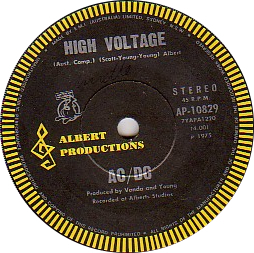 Albert Productions, founded in 1963, was one of Australia's first independent record production companies. It is a subsidiary of the venerable family-owned Sydney publishing company J. Albert & Son Pty Ltd, the oldest independent music publishing house in Australia. Albert Productions was originally established as an independent record production company but in 1970 they launched their own Albert Productions record label and in 1973 they established their own recording studio. The head of Albert Productions from its foundation in 1963 until his untimely death in 1990 was Ted Albert. He was the great-grandson of Jacques Albert, a Swiss-born music teacher who migrated to Australia in 1884. Jacques and his son Michel Francois (Frank) established established the Albert music business in 1890 when they began to import violins. In the early 1900s Alberts became one of the leading sheet music publishers in Australia. Alberts published the Boomerang Songster, containing lyrics of popular songs, bought the Australian rights to songs by Cole Porter, Irving Berlin and other songwriters of the 1920s to 1940s and acted as the local agent for many overseas publishers. Left: an Alberts mechanical royalty stamp from the late 1930s. These were issued to verify the payment of composer royalties and were affixed to the labels of records on which the publishing was owned or controlled by Alberts. The business was carried on by Jacques' son Frank, his grandson Alexis (later Sir Alexis) and great-grandsons Ted and Tony (now both deceased) and Robert. Not surprisingly, given their prominence in music publishing, the Albert family has also had a long and close close association with the Australasian Performing Rights Association (APRA) throughout its history; Frank Albert was one of the signatories to APRA's Articles of Association when the Association was formed in 1926. Until 1995 J. Albert & Son also owned one of Australia's largest radio networks, which included 2UW, Sydney's top pop station in the 1960s. When Ted entered the family business he became interested in building an Australian catalogue to complement Albert's international repertoire. The opportunity came when the Beat Boom swept the world in 1963-64. Alberts decided to establish a new division, Albert Productions, to enable them to expand beyond their publishing activities into record production. "... the time is at hand for a real boom in local compositions and recordings and we have therefore entered this field with much more drive than ever before. We have formed an A&R Department and have inaugurated a recording subsidiary we have called 'Albert Productions'." Ted became the managing director of the new company, Albert Productions. In the mid-Sixties, working with A&R man and co-producer Tony Geary, Ted produced a string of hit records for top acts including Billy Thorpe & The Aztecs and The Easybeats (and Ted also played on some of the Easybeats records). Ted was also a driving force behind the Albert Productions record label and Albert Studios, which he established in the early Seventies in partnership with former Easybeats Harry Vanda and George Young. Together they were either the producers or executive producers of the entire Alberts roster, which dominated Australian pop in the late Seventies and early Eighties. The formation of companies like Albert Productions was made possible by the changes that swept over the music industry in the 1950s, which led to the emergence of a new category within the music business -- the independent freelance record producer. Albert Productions was one of several such companies operating in Australia in the Sixties, including Leopold Productions, owned by Festival house producer Robert Iredale, and June Productions, run by former W&G and Astor staff producer (and Fable Records founder) Ron Tudor. The catalyst for these changes was the invention that revolutionised recording in the years after WWII -- magnetic tape, which was developed by BASF audio engineers in Germany in the mid-1930s. Before tape recorders were introduced in the early 1950s, the primary means of recording music was to record it live, direct-to-disc, in a single take. As the musicians played and sang, the sound was fed from the studio to a specially designed disc-cutting lathe (operated by trained engineers) which physically cut the audio track into the surface of an acetate master disc. This is the reason that the recording process is still sometimes referred to as "cutting a record". Recording engineers were limited in what they could achieve with the available technology -- the aural character of a recording was largely dependent on studio acoustics and microphone placement -- e.g. the distinctive sound of Bill Haley & The Comets' records like "Rock Around The Clock" was achieved by recording them in converted church with a domed ceiling. Mixing desks in those days had very limited tone controls and the only production effects were echo and reverberation. Before tape, this had to be created acoustically, by sending the sound to speaker placed at one end of a specially-constructed echo chamber; the echo-laden sound was picked up by a microphone at the other end of the chamber and relayed back into the control panel, where it could be mixed in with the 'dry' sound of the performers playing in the anechoic studio. Prior to the introduction of magnetic tape, studio recording was a capital-intensive industry dominated by a handful of huge multinational record companies like EMI. Typically, such companies were organised as vertically-integrated businesses that owned every level of the record-making and selling process -- the studios (e.g. Abbey Rd) where the recordings were made, the factories where they were pressed, the warehouses from which they were distributed. Companies like CBS and RCA also owned major interests in radio broadcasting and/or they also manufactured gramophones and radio receivers, and EMI owned the HMV record store chain to retail its own recordings. Studios represented a sizeable capital investment in real estate, plant and personnel. They had to be large enough to accommodate many musicians (even an orchestra) and they needed additional rooms including echo chambers, control rooms, a cutting rooms and storerooms, and a permanent staff of trained recording engineers. They were expensive to run and expensive to hire. In general, only those performers who had a contract with a major company got to use the company studio. The only other high-quality studios available were those belonging to radio stations or to the independent production companies that made radio programmes under contract. In the Fifties, the introduction of magnetic tape, multi-track recorders and vinyl records led to major changes in the structure of the music industry. The growth of independent recording studios, facilitated by the new technology and powered by the huge boom in the sale of rock'n'roll records, created created new strata within the industry within which the independent record labels and independent record producers could operate. The advent of the commercial recordings studio -- where facilities could be hired at an hourly or daily rate by anyone who could afford the fees -- meant that independent production companies and small labels could now gain regular access to quality recording facilities for the first time. It also meant that the large record companies were no longer limited by what their house producers and engineers could record in their own studios. Major labels could supply the growing demand for rock'n'roll records by 'outsourcing' recordings to independent producers, who were able to hire these commercial studios. The most famous independent studios -- like Olympic Studios in London or Goldstar in Los Angeles -- came to rival or even surpass the large corporate studios in terms of both prestige and the number of hits they produced. Technically too, tape revolutionised the industry. Compared to the cumbersome old lathes and fragile acetate discs, tape recorders were small and easy to operate; tape offered superior fidelity, longer duration and enormously increased flexibility. Tape could also be used to create echo and reverberation electronically, eliminating the need for large echo chambers, thus reducing both the size of studios and the cost of studio construction. Indeed, many of Joe Meek's landmark productions were done in his home-made studio in Holloway Rd using basic single-track tape recorders. More tape effects were developed during the mid-Sixties. In 1966, Abbey Rd engineer Ken Townshend invented the Automatic Double Tracking (ADT) technique, first used on The Beatles' "Tomorrow Never Knows" in late 1966. Legend has it that Townshend devised the technique in response to John Lennon's frequent complaints about the tedium of having to double-track his vocals.This clever development of tape echo enabled engineers to 'double' a lead vocal using a fractional tape delay. It took the industry by storm and instantly became a fundamental of popular music recording, as well as saving countless hours of session time previously taken by time-consuming vocal overdubs. Not long after, Olympic Studio engineer George Chkiantz developed the ADT technique further by inventing the famous "flanging" effect, a phase-shift effect, first used on The Small Faces' "Itchycoo Park" in 1967, which created the striking 'swoshing' sound that can also be heard on records like Russell Morris' "The Real Thing". Above all, tape meant that recordings could now be precisely edited, or enhanced by 'overdubbing' to or from other tapes. Tape made it possible for the first time to assemble the best possible performances, piece by piece, over time and even in different locations. Producers could now pick and choose the best (or the cheapest) studio, or as Brian Wilson did on Good Vibrations, they could use the distinctive 'sound' of different studios for different sections of a song. By the late Fifties, multi-track tape was making it possible to record voices and instruments separately, resulting in vastly improved fidelity and clarity, and it also allowed producers to create distinct aural environments for each element, rather than having one 'sound' for the entire ensemble. In Australia, independent commercial studios began to appear in the late Fifties and early Sixties. In the mid-to-late Sixties and early Seventies, the upper end of this new market was occupied by studios like Armstrong's, United Sound, Natec, Telelfil and TCS, but there were also many small operators like Ozzie Byrne. His tiny St Clair studio in the Sydney suburb of Hurstville was a home-made, two-room studio, set up in a former butcher's shop, and equipped with second-hand mono recorders -- but it was the site of some very significant Australian recordings, including The Bee Gees' breakthrough hit "Spicks and Specks". Thus, producers like Mickie Most, Burt Bacharach, Shel Talmy and Ted Albert created a new niche in the music industry -- production subcontractors who, for a fee and/or a percentage of the record sales, would sign performers to a production contract and then make a deal to supply the record company with finished recordings ready for mastering, manufacture and release. For those who were able to produce successful records, it proved to be a hugely lucrative enterprise -- the late Mickie Most, producer of The Animals, Donovan, Jeff Beck, The Seekers and founder of RAK Studios in London, was reported to have been worth more than $50 million dollars by the time he died in May 2003. Before Albert Productions built their own recording studio in 1973, they recorded at the 2UW studios and the old 2UW Radio Theatre in George St, Sydney as well as other studios such as the EMI and Phillips studios in Sydney and Armstrong's Studios in Melbourne. Typically, Alberts would sign new acts to a production contract; then,once the performer/s had secured a recording contract, Albert would hire a studio where they would record and produce songs. The finished tapes were then leased to the record company, which would master, press, distribute and (hopefully) promote the records. Alberts could benefit further if they signed their acts to a publishing contract with J. Albert & Son, which would generate more income from royalties and sheet music sales if the records sold well. This arrangement was similar to those between major British independent producers like Mickie Most and Shel Talmy and the companies who released the acts they produced, e.g. The Animals and The Who. Albert Production set up a deal with the Australian division of EMI, which leased the tapes from Alberts to manufacture and distribute the records on their Parlophone label. Albert Productions' first signing was leading Sydney band Billy Thorpe & The Aztecs. They shot to the top of the Australian charts in June 1964 -- right in the middle of The Beatles' tour of Australia -- with their 'beat' version of "Poison Ivy". After signing with Albert they scored a top ten hit with "Mashed Potato" in August 1964, the beginning of an eleven-hit run that included "Sick & Tired" (#2) and "Over The Rainbow" (#1). Albert's next signing made Australian music history. Ted was friends with a former real estate agent, Mike Vaughan, who had recently become the manager of a new Sydney band, The Easybeats. Vaughan was on the lookout for a label who was interested in recording them. Vaughan convinced Ted to attend a private performance, and one listen was enough to convince Ted that he had a hot property on his hands. Although he was a novice producer, Ted had an intuitive gift for selecting material, finding the right sound and honing the 'feel' of a song -- skills later highly praised by The Easybeats' main writer, George Young. Within the week The Easys were signed to a recording contract with Albert Productions. Their first single made a minor impact in Sydney but their second release, "She's So Fine" (May 1965) broke them nationally. Recorded at the soon-to-be-famous Armstrong's Studios in Melbourne, with a backing track produced by the legendary Roger Savage, the song shot to #1 in Sydney and #5 in Melbourne. It was the first of eight consecutive Australian top ten hits in just 18 months and all their classic Australian recordings were produced by Ted. By 1966 The Easybeats were the top group in the country, and there were high hopes for overseas success after manager Mike Vaughan managed to secure a contract with United Artists in mid-1966 to release their records internatinally. The band arranged to go to the UK in hopes of breaking into the charts internationally and Ted accompanied the group when they moved there UK in late 1966. He produced a number of tracks for them at Abbey Rd (most still offically unrelased to this day) but they were rejected by the record company and Ted returned home. Alberts enjoyed continued success in Australia with The Easybeats -- "Friday On My Mind" topped the Ausstralian charts late in 1966 and also reached #6 in the U.K and #16 in the U.S.A. At the 2001 APRA awards, "Friday On My Mind" was named as the most influential Australian song of the past 75 years. 1965-66 was a peak period for Alberts. As well as The Easybeats, Alberts also signed and recorded two other now-legendary (if shortlived) Sydney bands, The Missing Links and The Throb. They scored an unexpected coup in 1966 when they signed Melbourne duo Bobby & Laurie, who had been the one of the first 'Beat' acts to make the charts in Australia in 1964. Thought to have been past their prime, they came to Alberts after leaving the Go!! label and confounded critics by scoring three more Top 20 hits including "Sweet & Tender Romance", and their #1 hit "Hitchhiker". The late Sixties seems to have been a relatively quiet period for Alberts; The Missing Links, The Throb and Bobby & Laurie had all split up by the end of 1967 and the company appears to have produced few original recordings during this time. The Easybeats stayed on in England until they broke up end of the decade after a farewell Australian tour. Although Alberts continued to release their records, including their swansong St Louis in 1969, these were all produced overseas, recorded mostly in London and produced most by Vanda and Young. From 1963 and 1970 Albert Productions' recordings were released under the lease deal with EMI and released on their Parlophone imprint -- the same label as The Beatles. When Alberts resumed record production in 1970 they launched their own label, also called Albert Productions; this time the records were pressed, released and distributed by EMI. After the end of the Easybeats, the group's songwriting and production team Harry Vanda and George Young, had stayed in England, working to pay off the debts they (and their management) had run up during their UK sojourn. They wrote and recorded demos for other artists; and they released their own records under a variety of pseudonyms. Some of the songs they wrote were recorded by Australian performers, including Mike Furber ("I'm On Fire" and "Watch Me Burn") and Alison MacCallum, who had a Top Ten hit in 1972 with the Vanda-Young composition "Superman" (released on RCA). The first record released on the new Albert label was by British-born singer-songwriter Ted Mulry. It was an auspicious beginning -- Ted's version of Vanda & Young's "Falling In Love Again" was a Top Ten hit on several capital city charts. Ted had already scored a top five hit with his self penned track, "Julia", earlier that year. Ted went on to form a group, TMG (the Ted Mulry Gang) they scored an Australian national #1 hit in 1975 Ted's "Jump In My Car", which was followed by their remake of the 1917 jazz standard "Darktown Strutter's Ball" which reached #2 in 1976. The event that began the re-birth of Albert Productions as a force in the Australian record industry was the signing of John Paul Young, the former lead singer of Sydney band Elm Tree, who was then featuring in Jesus Christ Superstar. Early that year British producer and impresario Simon Napier-Bell had come to Australia to scout for new talent and produce records for Alberts. The first single he recorded was "Pasadena", a song sent from England by Vanda & Young with lyrics co-written by British actor David Hemming. It was a Top Ten hit in Sydney in April 1972 and its success enabled Ted Albert to persude George Young and Harry Vanda to return to Australia to run a recording studio for Albert records. Napier-Bell also produced "Excuse Me", which was a moderate hit (#29) in 1974 for Alison MacCallum. In late 1973 Harry and George returned from the UK and re-established themselves in Australia in partnership with Ted Albert; this was facilitated by the fact that in the mid-Sixties, they had opted to take a share in Albert Productions in lieu of cash. Their immense production and songwriting talents were instrumental in making the Albert label one of Australia's most successful record companies. Vanda & Young went on to produce hit records for many Australian acts as well as working on various side projects themselves. With Harry and George's on board, Albert Productions then established their own recording studio. Albert Studios was located in the heart of the Sydney CBD on the fifth floor of a building in King St, Sydney, between the MLC Centre and Centrepoint tower. Originally known as Studio 139, Alberts' Studio 1 soon became the rock studio in Sydney. To cope with the demand Alberts' Studio 2 was constructed in 1976 and Studio 3 was added in 1979. The King St complex was closed and the studios relocated to Cremorne in 1986. Albert Studios became the "hit factory" of Australian pop from 1974 onwards; . For almost a decade from 1974 until the mid-Eighties, Vanda & Young productions dominated the Australian charts. One of their first projects was for Stevie Wright, for whom they wrote and produced the epic 11-minute, three-part single "Evie" and his debut solo album Hard Road. "Evie" was a #1 smash hit and was also named 1974 'Song Of The Year'. Other Vanda & Young productions during this period inlcuded Graham Lowndes, Bartholemew John, Bobbi Marchini, Jackie Christian & Target and S.J.C. Powell. At the same time as reviving Stevie's career, Vanda & Young were also playing a key role launching the careers of George's two younger brothers, Angus and Malcolm, and their new band AC/DC. George's younger brothers Angus and Malcolm were given their first taste of the recording industry whilst working on the Marcus Hook Roll Band project in early 1974 and it was shortly after that they formed AC/DC. With Harry and George's guidance, and the skills of Albert's house engineer Bruce Brown, AC/DC scored hit after hit in Australia between 1975 and 1980, including rock classic like "High Voltage", "Dirty Deeds Done Dirt Cheap", "Jailbreak" and the immortal "It's A Long Way To The Top (If You Wanna Rock 'n' Roll)" which shot straight into the top five followed by their first national #1, "TNT". In 1977, after relocating to London, AC/DC had a British top twenty album with Let There Be Rock. Despite the tragic death of Bon Scott in February 1980 the band soldiered on, recruiting a new vocalist, Brian Johnson. Their next album, Back In Black became their biggest record to date with "You Shook Me All Night Long". AC/DC were recently named by RIAA as the fifth-highest-selling recording act in American music history. Their worldwide sales now total almost 100 million, with over 60 million records sold in the USA alone. Many producers would have been content with AC/DC's tremendous success, but Vanda & Young never rested on their laurels. Adept at almost every style of popular music, they churned out hit after hit for the ever-growing Alberts stable of artists. William Shakespeare scored two consecutive number one hits in 1974 with "Can't Stop Myself From Loving You" and "My Little Angel". In 1975 Vanda & Young took over the production of John Paul Young, and their song "Yesterday's Hero" gave John his first national #1. Under Vanda & Young's guidance he became the most successful Australian solo singer of the late '70s. After several major Australian and South African hits including "The Love Game" and "I Hate The Music", JPY broke into the European charts for the first time with "Standing In The Rain". In 1978 John's classic rendition of "Love Is In The Air" gave him and Vanda & Young a success to rival "Friday On My Mind" -- it reached #3 in Australia, #5 in the U.K and #7 in the U.S. It has since become the most covered Vanda & Young composition of all time. Vanda & Young also recorded themselves. During studio down-time they recorded "Hey St. Peter" (an old Easybeats-era song) and issued it under the pseudonym "Flash & The Pan". With support from Countdown, it hurtled up the charts, reaching #2 in January 1977. The follow-up "Down Among The Dead Men" went Top Ten in Australia and also charted in the UK. Possibly aided by fact that The Easybeats had always enjoyed a strong following in Europe, Flash & The Pan scored several more Top Forty European hits, including the U.K Top Ten hit "Waiting For A Train" in 1983; another Flash & The Pan song, "Walking In The Rain", was covered by Grace Jones. In the late Seventies, Alberts consolidated their position by signing inportant new acts including The Angels, Rose Tattoo, Heroes, Cheetah and Choirboys. The Angels' first Alberts release, the 1976 classic single "Am I Ever Gonna See Your Face Again" is one of the best-known and most popular Aussie rock songs never to have charted, as was another Angels standard, "Coming Down". But in 1978 the band finally hit the Australian charts with Take A Long Line and also amde inroads in Europe. Female vocal duo Cheetah (sisters Chrissie and Lyndsay Hammond) scored a Top 20 hit in 1980 and also enjoyed European success with the single "Spend The Night" from the album Rock And Roll Women. The Hammonds worked extensively with Vanda & Young, and provided backing vocals on many Alberts recordings. Now based in the UK, Chrissie Hammond has recorded extensively with keyboard maestro Rick Wakeman. Rose Tattoo were another important signing. Their first single for Alberts, produced by Harry and George, was "Bad Boy For Love". It reached #10 and over the next six years Rose Tattoo became one of the top bands in Australia,scoring five Top Forty hits, including the 1983 classic "We Can't Be Beaten". Choirboys formed in 1979 they became a major draw at Sydney's Royal Antler Hotel (formerly the unofficial "HQ" for Midnight Oil) and in 1983 went into the studio with producer (and former Ol' 55 member) Jim Manzie to record their self-titled album and single "Never Gonna Die". Manzie also worked with Vanda and Young on several Flash & the Pan recordings. The connection between NZ-born singer Mark Williams and Vanda and Young went back to Mark's NZ #1 hit in 1970 with his version of the V&Y track "Yesterday Was Just The Beginning". In 1990 Mark was signed by Alberts and scored a Top 5 hit with Show No Mercy. This was followed by the ZNZ album and a second album Mind Over Matter which featured not only tracks writtten by Mark but also the Vanda / Young composition "We Can Dream". In 1989 Ted moved into film, forming M&A Productions (Miall & Albert) and commissioned a young theatrical director, Baz Luhrman, to write and direct their first project. Tragically, Ted Albert didn't live to see the huge success of his first film -- he died suddenly from a heart attack during 1990. The film was Strictly Ballroom. It of course went on to win eight AFI Awards and the coveted 'Priz De La Jeunesse' at the Cannes film festival. It was the #1 box office hit in Australia in 1992 and the centrepiece of the movie's soundtrack, the remake of "Love is in the Air", reached #2 on the Australian charts, and had considerable worldwide success. In recognition of his huge contributions to the Australian music industry, Ted Albert was granted a posthumous Lifetime Achievement award at the 1990 ARIA Awards, and in his honour the Australasian Performing Rights Association (APRA) established the annual Ted Albert Award for Outstanding Service to Australian Music. In 1999 J. Albert & Son signed an exclusive print agreement with the major UK publisher Music Sales. The two companies had worked together since 1972, when Music Sales UK and Albert & Son set up Music Sales Australia as a joint venture. Later the Albert group took over distribution while Music Sales supplied most of the international product from London and New York. The new agreement was timely: earlier that year Sydney was hit by the most destructive hailstorm in the nation's history, and most of the stock in Music Sales Australia's warehouse was destroyed, and their warehouse was closed for two months. Today the Albert empire is run "quietly and conservatively" by Ted's younger brother Robert Albert, who is now in his late 60s. Albert Productions is run by CEO Fifa Riccobono. Albert's long-serving A&R manager Sam Horsburgh is also a member of the Young clan -- he is married to Margaret Young (who named AC/DC) and in the Sixties he was The Easybeats' road manager. As well as owning a large share and property portfolio, the Albert family maintains its 118-year involvement with the Australian music industry. The Alberts have for some years been included in Business Review Weekly's "Rich 200", their annual list of Australia's 200 richest families and in 2002 BRW estimated the family's worth at AU$190 million (up by $20 million from the previous year). Interviewed by BRW in 2002, Robert said: "Music is my first love. It is my family heritage and we will always be involved in music. It is hard for a family company to compete in the international music industry these days. We are good at spotting talent, working up talent, and vetting new songs. But the minute a new talent is identified, a big recording company steps in." Albert Studios recently diversified into the writing and production of music for television commercials, and the Albert family are also partners in a joint venture with Stuart & Sons, the Newcastle-based company that is making a new generation of innovative Australian-designed, Australian-made concert grand pianos which have been hailed as the biggest advance in piano design for more than 200 years. In recent years Albert Productions established an office and a recording studio in London, and in June 2002 they signed a new marketing and distribution agreement with Festival Mushroom Records, but this lapsed when the Festival Mushroom group was wound up in late 2005. In 2006, following the liquidation of FMR, Alberts signed a new distribution deal with Sony-BMG Australia. AP-9848 1972 Suffolk "Set me free"
"2 o'clock in the morning"
AP-10457 1974 Jackie Christian & Flight. "Love"
"Last Time I Go To Baltimore"
Royal Philatelic Society of New Zealand Inc. Please email webmaster@milesago.com if you have extra information or corrections or to report any problems with links.